Fit Me® Dewy + Smooth Foundation is rated 4.3 out of 5 by 8436. Have your brush ready? Starting at your hairline, swoop down to your cheekbone, and then over your jawline. Summer, spring, winter and fall. Look to your skin's texture needs each season for the right foundation. Rated 5 out of 5 by Yanelynelly from Long lasting! My sister gave me this foundation a while ago, not really a fan of foundation but the matte poreless change everything I love the long lasting look and the price!! Rated 5 out of 5 by Léna1706 from Super natural! As a person that absolutely hates the feeling of foundation, this product is perfect! It feels and looks completely natural, and while I know this is not the case for everybody (expand your range girl! ), it was very easy for me to find a shade that matched me perfectly. Blends really well on my face and with my concealer. Would completely recommend if you're looking for that dewy, bare-faced look. Rated 1 out of 5 by cash_775 from Disappointed to say the least... I had originally purchased the matte version of this foundation and loved it, but wanted to go for a more dewy look, so I purchased the Dewy and Smooth Fit Me. I bought the same shade as my matte version, and for whatever reason it was a lot darker, so I was unable to use it without looking ridiculous. So back to the store I went to purchase a lighter shade, and to my disappointment this foundation was awful. I tried using it now for a couple months, but no matter how I prep or how much finishing powder I use it just makes the situation worse. It separates from my skin, feels super oily and is so hard to get off at the end of the day. Very disappointed that this dewy foundation is not of the same caliber at the matte. Won't be purchasing this foundation again and now I'm stuck with two bottles of it. Honestly ridiculous. Rated 1 out of 5 by sophieamaris from Super Creasy This was the worst foundation I’ve ever used. It looks nice when I first put it on and it matches my skin well, but about an hour after application I looked in the mirror and it had completely settled into all the creases on my face, and as soon as I touched it it wiped right off my face. This is ridiculous considering I used a primer and set the foundation with powder and a setting spray. By the end of the day all the makeup had slid off my face. I used a makeup wipe and after wiping my face the wipe was still clean. I have never had a foundation settle into my creases or stick to my face this poorly. Rated 5 out of 5 by Laura40 from FINALLY!!! FINALLY!! Found a foundation in the drugstore and affordable that I don’t have to mix. dewy & smooth in the shade SOFT HONEY! My exact shade, perfect! Only thing about my fit me foundation bottle when I tighten my top it’s not on perfect and isn’t aligned right. But that’s ok, just found that weird. Never had a foundation bottle that closed differently. Lol! But I love this foundation. Makes my face flawless. Thank you Maybelline for making a shade to fit my skin tone. Rated 4 out of 5 by Brianna97 from Beautiful foundation! Not 5 stars because it needs a pump or applicator! I am currently using the fit me foundation dewy + smooth in the shade 220 of natural beige and i am also using the fit me loose finishing powder in shade 25. if just feels a little weird at first should be using something else or is that product fine? Hi Taylor! We appreciate your interest in our products. Everything you are using is good, however you may want to try a lighter shade for the finishing powder to match your foundation better. We suggest trying out the shade 20 Light Medium instead of the 25 Medium. In addition, try using our Facestudio Master Prime. This color correcting primer preps for makeup application by visually blurring away specific skin concerns. For more information about this primer, please visit this link here: http://tinyurl.com/ydcq5m7z. We hope you can try this out and love it! I USE YOUR FIT ME MATTE LIQUID FOUNDATION AND ID LIKE TO KNOW WHAT WOULD BE THE EQUIVALENT OF THE 335 CLASSIC TAN IN YOUR DEWEY FORMULA? Hi there! Thanks for reaching out. We appreciate your interest in our Fit Me&reg; Dewy + Smooth Foundation. We recommend checking out our Shade Finder to find the best foundation match for your skin type. To do so, use this link, https://www.maybelline.com/collections/fitme/foundation-match-finder. We hope you find this information helpful and you continue to explore our Foundation collection! Hi there! Thank you for reaching out about Fit me Foundation. Based on the shade you were using we suggest you try shade Buff Beige 130 In both Fit Me Dewy Foundation and Fit Me smooth powder. We hope this information is helpful and we hope you continue using Maybelline with great satisfaction! Is the classic ivory in the fit me matte the same shade in the fit me dewy? Or should I try a different shade? Hi there! Thank you for reaching out about Fit Me Matte. Yes, the classic ivory shade is the same in Fit me matte and Fit me Dewy. It is Ideal for normal to dry skin, this foundation hydrates and smoothes skin texture and leaves a naturally luminous finish. Protects with SPF 18. We hope you continue using Maybelline with great satisfaction! 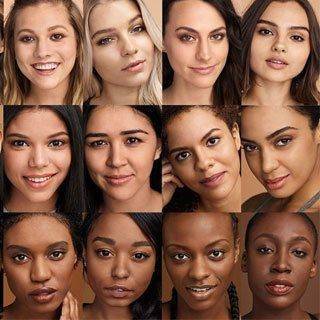 If I am shade 120 Classic Ivory on the Fit Me Stick, what shade would you recommend for this foundation ? Hi there! Thank you for your interest in our Fit Me Dewy + Smooth Foundation! Ideal for normal to dry skin, this foundation hydrates and smoothes skin texture and leaves a naturally luminous finish. Protects with SPF 18. Based on what shade you are using we suggest you also use Classic Ivory in this foundation. We hope this information is helpful and that you can always use Maybelline with great success! my Revlon rose tint beige was discontinued. Can not find anything in this shade help USED MAYBELLINE BEFORE REVLON AND THEY DISED MY COLOR WHAT SHADE WILL WORK FOR ME IN A FOUNDATION? Hi there! Thank you for reaching out about our Fit Me Dewy &amp; Smooth Foundation! This foundation hydrates and smoothes skin texture and leaves a naturally luminous finish and is provided in 24 Super Saturated Shades. To find your perfect shade use our Virtually Try On Tool for a Virtual Makeover. To view this tool on our website here is a link http://tinyurl.com/y3eqpqt6. We hope this information is helpful! hi..wats d correct shade for wheatish skin?? Hi there! Thank you so much for your interest in our Fit Me Dewy &amp; Smooth Foundation! We have a shade finder for you to find your perfect match which you can find here: http://tinyurl.com/y75a2z3z We hope this information is helpful! Hi Tanya! Thank you for your interest. We recommend going to our local beauty supply and having a professional help you find the perfect shade. Thank you!